O God, whose abundant grace prepared Saint Henry to be raised by you in a wonderful way from the cares of earthly rule to heavenly realms, grant, we pray, through his intercession, that amid the uncertainties of this world we may hasten towards you with minds made pure. Through our Lord Jesus Christ, your Son, who lives and reigns with you in the unity of the Holy Spirit, one God, for ever and ever. O God, who in the abasement of your Son have raised up a fallen world, fill your faithful with holy joy, for on those you have rescued from slavery to sin you bestow eternal gladness. Through our Lord Jesus Christ, your Son, who lives and reigns with you in the unity of the Holy Spirit, one God, for ever and ever. Henry II, successively Duke of Bavaria, King of Germany and Emperor, devoted himself to the spread of religion by rebuilding churches and founding monasteries. Until the end of his life he displayed the virtues of a great saint. Together with his wife, St. Cunegunda, he founded the bishopric of Bamberg and, at his death in 1024, was buried in the cathedral there; his holy wife was laid by his side fifteen years later. According to the 1962 Missal of St. John XXIII the Extraordinary Form of the Roman Rite, St. Henry's feast is celebrated on July 15. Saint Clelia Barbieri, whose feast is celebrated in Italy, was the Foundress of the Congregation of the "Suore Minime dell'Addolorata". She has the distinction of being the youngest founder of a religious community in the history of the Church. St. John Paul II canonized her on April 9, 1989. Historically today is the feast of St. Mildred the first abbess of the English monastery of Minster-in-Thanet founded by her mother, Saint Ermenburga. As a nun who mortified herself with frequent fasts, Mildred was characterized by an exceptional humility, gentleness, and serenity of spirit. She was remembered for her compassion to widows, orphans, the poor, and the troubled. Her death came at the end of a prolonged and painful illness. Following the translation of Mildred’s body to Canterbury in 1033, her relics became highly revered by the city’s pilgrims. Henry, surnamed the Pious, Duke of Bavaria, became successively King of Germany and Emperor of the Romans; but not satisfied with a mere temporal principality, he strove to gain an immortal crown, by paying zealous service to the eternal King. As emperor, he devoted himself earnestly to spreading religion, and rebuilt with great magnificence the churches which had been destroyed by the infidels, endowing them generously both with money and lands. He built monasteries and other pious establishments, and increased the income of others; the bishopric of Bamberg, which he had founded out of his family possessions, he made tributary to St. Peter and the Roman Pontiff. When Benedict VIII, who had crowned him emperor, was obliged to seek safety in flight, Henry received him and restored him to his see. Once when he was suffering from a severe illness in the monastery of Monte Cassino, St. Benedict cured him by a wonderful miracle. He endowed the Roman Church with a most copious grant, undertook in her defense a war against the Greeks, and gained possession of Apulia, which they had held for some time. It was his custom to undertake nothing without prayer, and at times he saw the angel of the Lord, or the holy martyrs, his patrons, fighting for him at the head of his army. Aided thus by the divine protection, he overcame barbarous nations more by prayer than by arms. Hungary was still pagan; but Henry having given his sister in marriage to its King Stephen, the latter was baptized, and thus the whole nation was brought to the faith of Christ. He set the rare example of preserving virginity in the married state, and at his death restored his wife, St. Cunigund, a virgin to her family. He arranged everything relating to the glory or advantage of his empire with the greatest prudence, and left scattered throughout Gaul, Italy, and Germany, traces of his munificence towards religion. The sweet odor of his heroic virtue spread far and wide, till he was more celebrated for his holiness than for his imperial dignity. At length his life's work was accomplished, and he was called by our Lord to the rewards of the heavenly kingdom, in the year of salvation 1024. His body was buried in the church of the blessed apostles Peter and Paul at Bamberg. God wished to glorify His servant, and many miracles were worked at his tomb. These being afterwards proved and certified, Eugenius III inscribed his name upon the catalogue of the saints. Patron: Basel, Switzerland; Benedictine Oblates; childless people; disabled people; dukes; handicapped people; kings; people rejected by religious orders; physically challenged people; sterility. Symbols: Sword and church; lily; crown; dove on an orb; model of Bamburg cathedral. Read more about St. Henry and his wife, St. Cunegund. 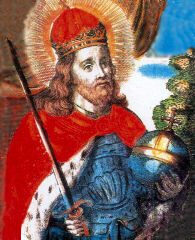 St. Henry was a Christian emperor who acted justly. It is all too obvious today what a danger it is to have leaders who do not value the God-given dignity and rights of each human person. Offer a Mass, make a holy hour or say a rosary for your elected officials. St. Mildred was the daughter of King Merewald of Magonset and his wife, St. Ermenburga (alias Aebbe of Minster-in-Thanet); and therefore sister of SS. Milburga and Milgith. At an early age, her mother sent her to be educated at Chelles in France, where many English ladies were trained to a saintly life. A young nobleman, related to the Abbess of Chelles, entreated her to arrange that he might marry this English princess. The abbess tried to persuade her, but Mildred said her mother had sent her there to be taught, not to be married, and all the abbess's advice, threats and blows failed to persuade her to accept the alliance offered to her. At last the abbess shut her up in an oven in which she had made a great fire; but after three hours, when she expected to find not only her flesh but her very bones burnt to ashes, the young saint came out unhurt and radiant with joy and beauty. The faithful, hearing of the miracle, venerated Mildred as a saint; but the abbess, more infuriated than ever, threw her on the ground, beat, kicked and scratched her and tore out a handful of her hair. Mildred found means to send her mother a letter, enclosing some of her hair, torn from her head by the violence of the abbess; and Queen Ermenburga soon sent ships to fetch her daughter. The abbess, fearing that her evil deeds should be made known, would, on no account, give permission for her departure. Mildred, however, fled by night; but, having in her haste forgotten some ecclesiastical vestments and a nail of the cross of Christ which she valued extremely, she managed to return for them and brought them safely away. Upon her arrival back in England, she landed at Ebbsfleet where she found a great square stone, miraculously prepared for her to step on from the ship. The stone received, and retained, the mark of her foot and was afterwards removed to the Abbey of Minster-in-Thanet and kept there in memory of her. Many diseases are said to have been cured for centuries after, by water containing a little dust from this stone. It was often removed from its first situation, until an oratory was built for it. With her mother's consent, Mildred joined her at her foundation of Minster-in-Thanet. She was given the veil by Theodore, Archbishop of Canterbury, at the same time as seventy other nuns. On St. Ermenburga's death, Mildred succeeded her as Abbess of the community, to whom she set a holy example and by whom she was much beloved. An old story is recorded that one night, while she was praying in the church of her monastery, the devil blew out her candle, but an angel drove him away and relighted it for her. Mildred died at Minster of a lingering and painful complaint, on 30th July AD 732. 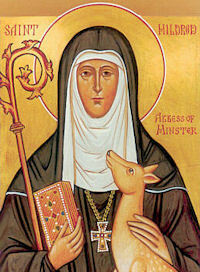 She was succeeded by St. Edburga of Minster-in-Thanet. During the latter's rule, it apparently happened that the bell-ringer fell asleep before the altar. The departed Mildred awoke him with a box on the ear, exclaiming, "This is the oratory, not the dormitory!" She continued to be an extremely popular saint, eclipsing the fame of St. Augustine, in the immediate neighborhood of her monastery, where the place that used to be proudly pointed out as that of his landing came to be better known as "St Mildred's Rock." In 1033, St. Mildred was translated to St. Augustine's Abbey in Canterbury and minor relics also passed from here to Deventer in Holland where she was honored on 17th July; though her feast, in England, is three days earlier. There was, however, a rival set of relics which were said to have been hidden at Lyming, with those of her sister, Milgitha, during the Viking devastation. These were given to the Religious Hospital of St. Gregory in Canterbury, by Archbishop Lanfranc in 1085. Mildred is represented in art holding a church and accompanied by three geese, as she was protector against damage by such wild birds. Read the Life of st. Mildred, by a lay-tertiary of st. Francis. Clelia Barbieri was born to Giacinta Nannetti and Giuseppe Barbieri, on February 13th, 1847 in a village called "Budrie" of S. Giovanni in Persiceto in the outskirts of Bologna, Italy and in the Archdiocese of Bologna. Her parents were of different origins: Giuseppe Barbieri came from perhaps the poorest family of "Budrie" while Giacinta from the most important family in town: he worked as servant for Giacinta's uncle, the district's medical doctor, while she was the daughter of the well-to-do Pietro Nannetti. After her much-contested wedding, the wealthy Giacinta accepted the poverty of a laborer's life and moved from a comfortable home to the humble cottage of her father-in-law, Sante Barbieri; nevertheless forming a family built on the rock of faith and a totally Christian life. In line with her mother's expressed wish, she was baptized Clelia, Rachele, Maria on the very day of her birth. The mother taught Clelia to love God early in her life placing in her heart the desire for sanctity. One day Clelia asked her, "Mother, how can I become a saint?" In the meantime Clelia also learned the art of sewing, spinning and weaving kemp which was the most important work of the district. In 1855, during a cholera epidemic the then eight-year-old Clelia lost her father and through the generosity of her uncle, the doctor, she, her mother and younger sister Ernestina moved into a more comfortable house near the parish church. For Clelia the days became more saintly and dedicated. Anyone who wanted to see her could always find her either at home weaving and sewing or in church praying. Although it was usual at that time to receive First Communion almost at adulthood, Clelia due to her unusual catechistic preparation and spirituality, made hers on June 17th, 1858, at only eleven years of age. This was a decisive day for Clelia's future since it was then that she had her first mystic experience: exceptional contrition and repentance for her own sins and those of the world. She underwent anguish and suffering for the sins that crucified Christ and so sorrowed Our Lady. From the day of her First Communion, the crucifix and Our Lady of Sorrows inspired her saintly soul. At the same time she had a first inspiration as to her future which she perceived as based on prayer and good works. In adoration before the Holy Tabernacle she was motionless, rapt in prayer, while at home she was the companion and model for the other working girls. Far more mature than her years, she found in her work the first contact with the girls of "Budrie" where working hemp fibers was the main occupation and where all were engaged in this hard work. Clelia brought something particularly personal to her little world: she worked with joy and love, praying and thinking of God at all times and even speaking of Him to her companions. While Clelia was not Martha, Completely devoted to the cares of the world, yet she dedicated herself lovingly to the service of those most loved by Our Lord, the very poor, to the extent that her delicate hands were marked early in her short life with the hard labors she undertook. While Clelia was not Mary who abandoned, excluded and neglected everything to prostrate herself in love and devotion, yet Clelia had no other thought, no other love than that for Our Lord whom she carried in her heart and soul as she walked with Him through life as if already in his world. She lived in charity, completely dedicated to loving her fellowmen without restraint. She forgot and even ignored her body. She was happy to belong to the Lord and her happiness rested, in fact, in thinking only of Him. Something, however, compelled her to turn towards her fellowmen, the poorest and most tried, who often waited in vain for some small sign of love and brotherhood. A fervent faith burned inside her, and she felt that she "must go" to give herself to all of God's poor. She loved that solitude which would permit her to reach God more fully, but she left the protection of her home and went forth inspired by her all-consuming love for mankind. At this time in history, there existed in the Church a group called "The Christian Catechism Workers" who were mainly men whose aim it was to combat the prevalent religious negligence of the times. At "Budrie" the group was led by an elderly schoolteacher. Clelia aspired and then became one of the Christian Catechism Workers. Then, at "Budrie" with her acceptance, the catechism group was reborn and attracted others with her very same dedication and faith. At first, Clelia was admitted as an assistant teacher and was the least important member, but soon her surprising talents and preparation evidenced themselves so that the senior members placed themselves under her leadership. Having rejected several flattering marriage proposals, the group of young ladies which had sprung up from the Catechism group, elected Clelia as their leader and conceived the idea of a community devoted to an apostolic and contemplative way of life. This was to be a life of service which would spring from the Eucharist with daily Holy Communion and would ennoble itself with the teaching of catechism to the farmers and laborers of the area. The idea could not become a reality immediately due to the political situation at the time of Italy's unification (1866-67). However, it was finally realized on May 1st, 1868 when with the bureaucratic and local problems solved, Clelia and her young friends moved into the so-called "teacher's house" where the Workers for Christian Catechism had formerly met. This was the humble beginning of Clelia Barbieri's religious family which later was to be named the religious community of the "Suore Minime dell'Addolorata". "Minime" because of Clelia's devotion to the saint, Minimo Romito di Paola, S. Francesco, patron and provident protector of the young community; "dell'Addolorata" because this title of Our Lady of Sorrows was the most loved of all of Our Lady's titles by Clelia Barbieri. After moving into "the teacher's house", a series of extraordinary events in the form of assistance to the young community occurred which were undoubtedly the work of Divine Providence and without which the group could never have survived. The small group was inspired by Clelia's physical and moral sufferings in her darkest hours and in the absurd humiliations she endured at the hands of those who should have been more understanding. However, her faith and devotion in prayer were always extraordinary. In the small "Budrie" community there was faith, a desire for God and a missionary zeal full of creativity and imagination by no means based on any organization support which was virtually nonexistent. Clelia was the moving spirit. The small initial group grew as well as the number of poor, sick and young boys and girls needing catechism and religious instruction. Slowly, the people began to see Clelia as a leader and teacher of the faith. They started calling her "Mother" although she was only twenty-two years old. They called her with this title until her death which came about very shortly. The dormant tuberculosis she had always carried, suddenly flared up only two years after she had founded the order. Clelia died prophesizing to the sister at her bedside, "I'm leaving, but I'll never abandon you. When in that alfalfa field next to the church there will be a new community house, I will no longer be with you ... You will grow in number, and you will expand over plains and mountains to work in the vineyard of the Lord. The day will come when here at 'Budrie' many will arrive with carriages and horses ..." And she added, "I'm going to Heaven and all those who will die in our community will enjoy eternal life". She died on July 13th, 1870 with the happiness of one going to meet her Spouse and beloved Lord. Clelia's death prophecy has been fulfilled. The religious order Suore Minime dell'Addolorata has expanded and continues to grow. It extends throughout Italy, in India and in Tanzania. Today, the sisters following in Clelia's footsteps, humbly continue their useful work of assistance to all in need and now number three hundred spread over thirty-five community houses. 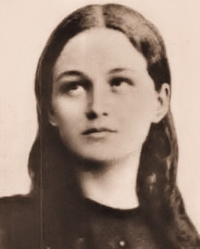 Being only twenty-three at the time of her death, Clelia Barbieri is the youngest founder of a religious community in the history of the Church. She was canonized at Rome on April 9, 1989 by John Paul II.